Virginia Tech will establish a 1 million-square-foot graduate campus in Alexandria as part of the commonwealth’s pitch to attract Amazon’s second headquarters. The $1 billion Virginia Tech Innovation Campus will serve to grow high-tech talent in the Washington, D.C., region. Amazon officially announced Tuesday it would divide its second headquarters among Northern Virginia and New York City. 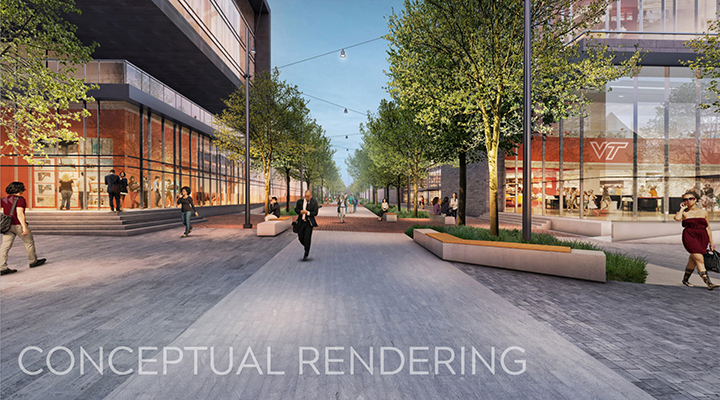 The campus will be located on U.S. Route 1 at National Landing in Alexandria near Potomac Yard. The land, commonly called Oakville Triangle, is owned by Blackstone Group LP’s real estate fund. It will be developed by Stonebridge. 100,000 square feet of retail and support spaces. Virginia and Virginia Tech each have committed to provide $250 million to seed the project. Virginia Tech also has agreed to increase its undergraduate enrollment at its Blacksburg campus by 2,000 students in computer science, computer engineering, software engineering and related disciplines.